Sales and Supplies of Male and tapered Spouts and Spigots. These wine, olive oil and water taps are made from Food Grade Plastic and come in three models, two of which are the tapered FGT150 and FGT153 taps which in turn come in three different tapered thread sizes . Similar, male threaded, fast flow taps are available in 1/2'' and 3/4'' are available for traditional container installation. These fittings are ideal for wine making, sampling and dispensing and other alimentary applications and do fit medium and larger sized wooden barrels and other plastic or resin containers. These food grade Spigots are a highly versatile and a cheaper alternative to metal fittings. The FGT Tap tapered range is relatively new into the international market and any interest from international wholesalers and retailers in marketing this range is welcome. We also offer a range of similar male plastic taps in 1/2'' and 3/4'' in BSP. 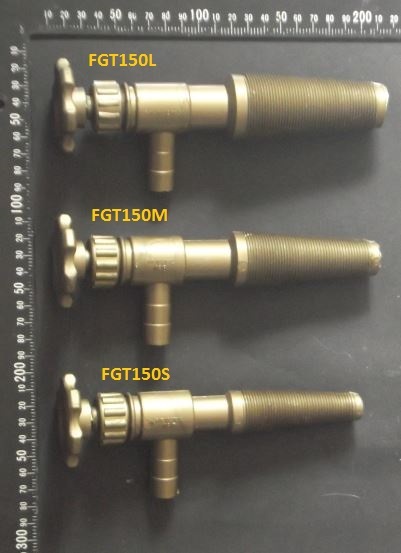 LEFT : FGT150 Tapered Fittings - Food grade Tapered Plastic FoodGrade Valves Spigots ideal for wooden barrel or tank installation. Tapered outer diameter is within the 22mm/28mm range. Tapered outer diameter is within the 25mm/34mm range. Tapered outer diameter is within the 31mm/40mm range. 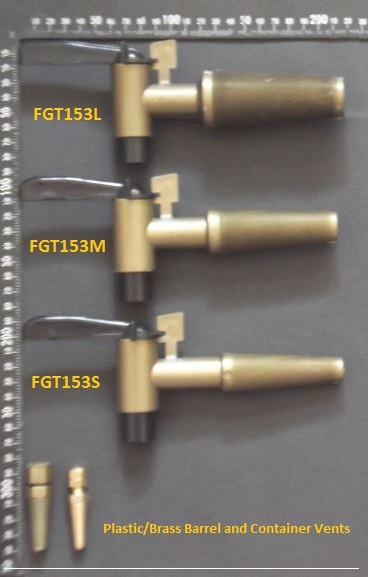 LEFT: FGT153 Tapered Fittings - Fast Flow Food grade Tapered Plastic Food Grade Valves Spigots ideal for wooden barrel or tank installation. LEFT: Male Fittings - Fast Flow Food grade Tapered Plastic Food Grade Valves Spigots ideal wine container and tank installation. Outer thread diameter is 26mm. Outer thread diameter is 21mm. Sample , Trade and Non Trade Orders: These Food Grade Tapered and Male Threaded Plastic Taps, Valves and Spigots and vents are usually in stock and can be purchased in single, small or larger quantities.